The above are edited excerpts by Gary Christenson (deviantinvestor.com) from his original article* entitled Gold And Silver Price Projection Based On US Debt Growth. The disconnect in the correlation this past spring is difficult to explain in the midst of an epic rush for physical gold driven by the Eastern hemisphere apart from the fact there is a disconnect between the needs of institutional investors (which focus on trading in the futures markets) versus the needs of ordinary people and small investors (looking to preserve their capital as their cost of living is rising at another rate than the official CPI). With recent evolutions, including the US central bank withdrawing their tapering plans, the rise of the debt ceiling and U.S. debt value surpassing 17 trillion dollar, gold seems to be steadily reacting again in line with its “expected” correlation…]Were] this correlation to hold, what would the gold and silver price be five years from now? Given the rate of growth of the debt, it becomes an easy exercise of math. Mind the underlying assumption though. Examine the following graph. It is a graph of smoothed* annual gold and silver prices (by taking monthly closing prices and calculating a 24 month simple moving average. Annual prices graphed are the average of the 12 average monthly prices per year) and the official U.S. national debt since 1971 when the dollar lost all gold backing and was “temporarily” allowed to float against all other un-backed debt based currencies. All values start at 1.0 in 1971. Dashed lines indicate guesses for the future normalized values for gold, silver, and the national debt. [suggests that] it is safe to say that, on average, gold and silver will continue rising, along with the national debt, as they all have for the past 42 years. Furthermore, like the national debt, both gold and silver (and probably most consumer prices) will increase substantially from here, until some traumatic “reset” occurs. What sort of reset? A “black swan” event that is unpredictable, by definition. A dollar collapse when foreigners say “enough” to the dollar debasement policies pursued by the Fed and the US government. A collapse of the Euro or Yen for any number of reasons. A banker admits that most of the official gold supposedly held in New York, London, and Fort Knox is gone and has been sold to China, India, and Russia. You name the false flag operation. My guess: Gold and silver prices will rise gradually for a while, and then quite rapidly after one of the above “financial icebergs” smashes into our “Titanic” world monetary system. 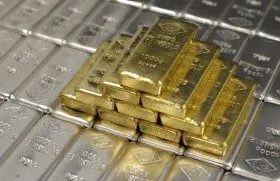 [As I believe that] we will have difficulty locating physical gold available for sale after such an event occurs, even at much higher prices, now would be a good time to purchase physical gold and silver for storage in a secure storage facility. Paper gold will not be safe. Congress has acted. The President has spoken. The Federal Reserve will continue “printing” dollars to increase banker profitability, fund the government, and fight the forces of deflation. This is business as usual – as it has been for the past 42 years.